Shrouded in horror-film mystique and pro­claiming themselves to be “the Stooges of the 90s,” Marilyn Manson and company are the newest proponents of the shock-rock school of David Bowie, Kiss, Alice Cooper, and Iggy Pop. Sweet Dreams, from the Smells Like Children album, was the song that provided the group with their first big MTV hit. A strange offering to be sure, it reinvents a mid-80s syn­thesizer-based Eurythmics track as an unlikely collision of death metal and techno-pop for the post-grunge alternative era. There is a second version of song Sweet Dreams. 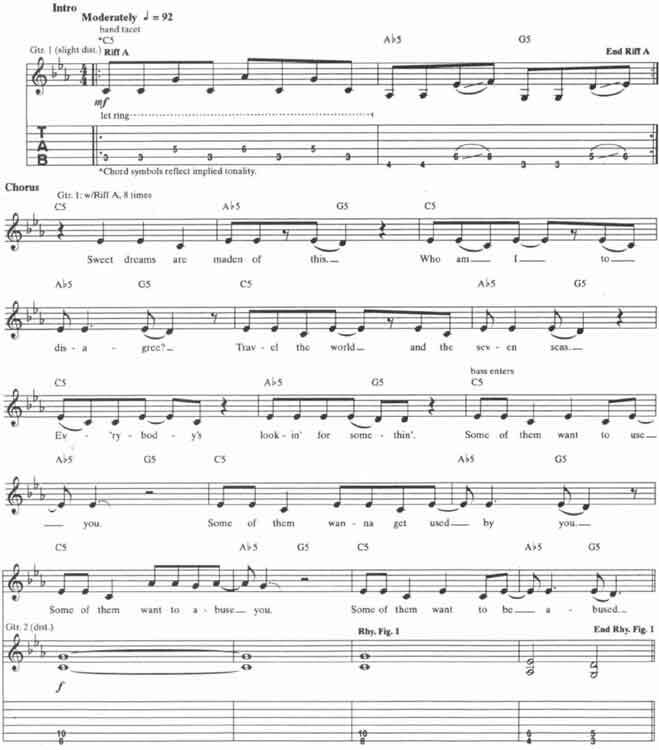 Earlier we transcribed this song, the first version can be found here. The main riff found in the intro, choruses, and solo (Riff A), is based on two-note, movable power-chord shapes with added tones. The first half has a pedal point effect with а С note on the fifth string remaining stationary while G and Ab notes on the fourth string alternate above it. At the heart of this is a C5 power chord form [Fig. 1]. The second half uses Ab5 and G5 chords with notes similarly added to the shapes [Fig. 2]. Here, the added notes are slid into, and the articulation is different, yet the concept of adding notes to the basic power chord remains the same. Each half of Riff A demonstrates a different application of the same idea. In the interlude between the choruses, we find a wah-wah version of Riff A. The extreme effect is created by rocking the wah-wah pedal quickly back and forth (toe-down to toe-up) in 16th-note rhythm to produce a quavering tremolo sound. To get a handle on this technique, begin by playing the riff slowly and very deliberately in an eighth-note rhythm. Between each pick attack move the pedal evenly from toe-down to toe-up position and back again for the next note. This creates the down-up pattern which must occur between each note of the pat­tern. Gradually speed the pattern up, maintain­ing the same rhythmic division of the beat with the wah-wah motion, until you match the tempo of the record. Manson guitarist Zim Zum claims that the Jim Dunlop Jimi Hendrix wah-wah pedal has “a real good sweeping range,” which he finds to be ideal for the riff. It’s a part of Marilyn Manson Sweet Dreams guitar lesson. © 2012 - 2019 TabsClub Powered by TabsClub 42 queries in 0.419 seconds.